With our stylish solid hardwood TV units you gain valuable storage space and avoid the inevitable tangle of wires and cables behind your television. Complete your living room decor by investing in one of our beautiful solid hardwood TV cabinets and TV units. As practical as they are stylish, we’ve designed them to match our stunning furniture ranges and provide you with excellent storage for your television and all its accessories. Our TV cabinets are made with convenient drawers and shelving to store your blu-ray player, TV Box, consoles, and more, with special exit holes at the back to manage the many cables to minimise visual clutter. 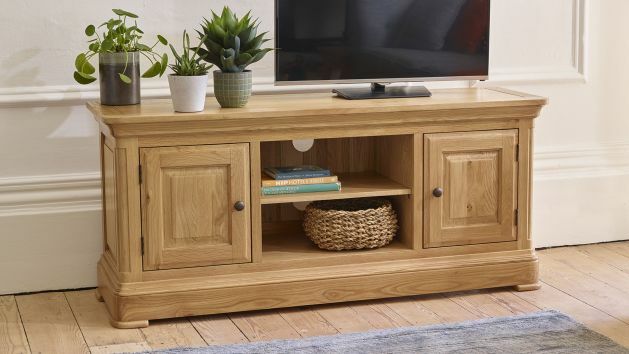 Featuring a solid oak top to hold the TV, and dovetail joints in the drawers, our TV cabinets are designed with high quality touches to last for years to come. For smaller or awkwardly shaped spaces, we have also designed a beautiful selection of corner units that help to make the most of any space, keeping the TV as unobtrusive as possible. Each of our TV cabinets has been made to complement one of our more than 20 ranges of furniture, so you're guaranteed to find one that will fit your living room decor. With many varieties of solid hardwood units, including rustic and natural solid oak, mango, and striking painted styles in solid hardwood, you’re bound to find the ideal TV unit for your living room. Browse our stunning selection of TV cabinets, and don't forget about our free delivery options as standard.